There are different types of termites that attack homes here in San Diego and in Southern California. The type that creates the most damage is the Subterranean and Formosan Termites. They are most commonly identified by the mud tubes that they create one the wood, which is basically a way of creating their own moist environment. Do not worry, our licensed inspectors are trained and fully qualified to identify and control any Subterranean Termite infestation. The first step is identification, and afterwards a customized solution will be created to assist you in resolving your pest problem. Subterranean termites start nests in the soil then extend the colony into structures where damage occurs. Because the "root" of the colony is always in the soil, subterranean termite control usually involves applying insecticide to the soil. In the past, highly toxic and persistent insecticides, like chlordane and heptachlor, were applied to the soil during construction. These "pre-construction" treatments created a toxic barrier that prevented termites in the soil from moving into the structure and also stopped colonies from getting started. Nowadays lower toxicity materials like bifenthrin , fipronil, imidacloprid, permethrin and cypermethrin are used for pre-construction soil treatments for subterranean termite control because the old insecticides are no longer registered in the US. Subterranean Termite treatment can also be applied after construction ("post-construction") by injecting insecticide into the soil or by digging a trench around structures and treating the soil directly. Both pre- and post-construction treatments should be performed by a pest control firm because they require special equipment and experience. The Sentricon Termite Control System consists of a series of termite control bait stations surrounding the perimeter of your house. The pest control company periodically monitors these stations and, once they detect termite activity, they replace the wood bait with a poison that is supposed to wipe out the colony. Sentricon is probably the most 'green' solution out there, but its effectiveness has also been brought into question by a number of so-called experts. Termidor, on the other hand, is a chemical termiticide that provides a soil barrier surrounding your house. According to studies by reputable Universities, it's far more effective than Sentricon, and not particularly dangerous to people. 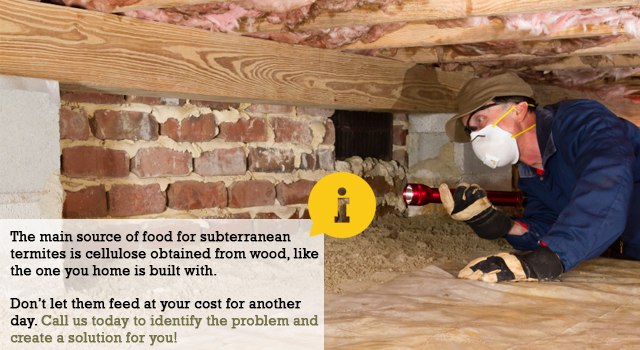 Here are some of the things that you can do in order to protect your home from Subterranean Termites. Although there is no way of making your property termite free, this will help it last longer with no problems. If you do see any infestations arise, give us a call as soon as possible to control it before it get's any bigger or creates any damage. Like other termites, the Formosan subterranean termite is a social insect living in colonies with a division of labor between specialized castes. Formosans typically nest in the ground, but sometimes build aerial colonies with no ground contact if sufficient water is available. They have even been found flourishing in Florida and Hawaii on the rooftops of high-rise apartment buildings. Seasonally, new kings and queens form as the colony matures. Winged males (kings) and females (queens) from the same or different colonies leave the nest to mate and begin a new colony. These new reproductive termites are tan in color, have long wings, and are called alates. As with most termites, only a small fraction of the alates that leave the colony are successful at starting new colonies. In San Diego, sporadic mating flights of Formosans occur from May to September. They always occur in the early evening and on days during which the daytime temperature exceeds 88°F (31.1°C). Workers hatch from eggs laid by the queen and are the only stage that feeds on wood. Colonies can attain 2 million workers within 5 years (Higa 1981). Like most species of termites, Formosans also have a defensive caste called a soldier. Baiting has the advantage of minimizing pesticide use. A termite colony is killed if worker termites feed on strategically placed bait and pass it among themselves and to the queen and soldiers. Conventional liquid termite treatments kill only the termites that they contact, and they protect structures by providing a repellent and toxic barrier.